Facts about Dandie Dinmont Terrier Dog, "Scientific name for Dandie Dinmont Terrier Dog, or domestic canine, is Canis lupus familiaris". The Dandie Dinmont Terrier Dog belongs to the family of terrier. The Dandie Dinmont Terrier Dog has a very interesting story. They originate from England and border county of Scotland. It is believed that in the 16th Century, they were only used for hunting otters. There are several theories that states that, the Dandie Dinmont Terrier Dogs may be a type of Border terrier and others think that there are Scottish terriers. Dandie Dinmont Terrier Dogs sweat glands are between their paw pads. It is a Fact a Dandie Dinmont Terrier Dog sees in color and have better low light vision. Dandie Dinmont Terrier Dogs have three eyelids, a lower lid, an upper eyelid lid and a third lid, that is called a haw or nictitating membrane, this keeps the dogs eye protected and moist. Dandie Dinmont Terrier Dogs eyes have a special membrane for seeing better at night, called a tapetum lucidum - a dogs reflective layer in the choroid chiefly of nocturnal, causing the eyes to glow when light at night hits the eyes and they consist of some layers of smooth flat cells covered by a section of double deformed crystals. 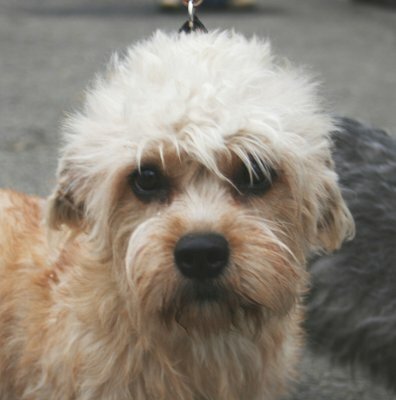 Dandie Dinmont Terrier Dog have a distinctive top knot of hair on the head. The legs are short and the body is long. They have pendulous ears, a masculine neck which developed due to their use against larger game. From the withers, the height is 8 to 11 inches (20.3 to 27.9 cm). The Dandie Dinmont Terrier Dogs weigh around 18 to 24 pounds (8.1 to 10.9 kg). All dogs are identical in makeup big or small– 42 permanent teeth and 321 bones. Dandie Dinmont Terrier Puppies have 28 teeth and when they become adult Dandie Dinmont Terrier Dogs they have 42 teeth. When puppies are born, they have no teeth and are deaf and blind. Dandie Dinmont Terrier Puppies for their first few weeks will sleep ninety percent of the day and their vision is not fully developed until after the first month. Dandie Dinmont Terrier Dogs coats colors are either pepper or mustard. The pepper color ranges from dark bluish black through to light silvery gray. The mustard varies from reddish brown to a fawn where the head is almost white. Generally the Dandie Dinmont Terrier Dog legs and feet have darker colors whereas the upper body’s colors are lighter. All in all, the colors blend perfectly well. One cannot ignore the depth of the coat which is around 2 inches (5 cm). Among all the terrier family, Dandie Dinmont Terrier Dog are the only ones that are docile. The dogs are friendly, though very tough. The Dandie Dinmont Terrier Dog can be good companions and guards but normally good for older kids. They are known for digging big holes within a very short period. The Dandie Dinmont Terrier Dog are somehow independent since they don’t demand so much attention from their owner. They are not trusted to stay around small animals, though they can be trained to stay with cats. Dandie Dinmont Terrier Dog’s nose prints can be used to identify them, their nose prints are like a humans finger print. It is a Fact a Dandie Dinmont Terrier Dog smells more than 1,000 times stronger than that of a human. A Dandie Dinmont Terrier Dog’s nose, secretes a thin layer of mucous that helps it absorb scent, after that they lick their noses and sample the scent through their mouth. Dandie Dinmont Terrier Dogs have two times the amount of ear muscles than people. It is a fact a Dandie Dinmont Terrier Dog can hear a sound at four times the distance of a human. Sound frequency is measured in Hertz (Hz) Def-Hertz is the measurement of frequency, explicitly it's one cycle per second. The higher the Hertz are, the higher the pitched the sound is. Dandie Dinmont Terrier Dogs hear best at 45,000 Hz to 65,000 Hz, while humans hear best at around 20 Hz to 20,000 Hz. If purchasing a Dandie Dinmont Terrier Dog from a breeder, make sure to find a good breeder with references, check at least two to three of the puppies that were purchased from this breeder. Dandie Dinmont Terrier Club in 1875, was formed in Scotland, and the standards for the Dandie Dinmont Terrier Dog were formed. This is the third oldest breed club in the world as of today. A Dandie Dinmont Terrier Dog’s mouth can apply approximately 150 to 200 pounds of pressure per square inch and an American Pit Bull Terrier, German Shepherd Dog and a rottweiler can have 320 LBS of pressure on avg. Female Dandie Dinmont Terrier Dogs are in heat for matting for about 20 days twice a year. Female Dandie Dinmont Terrier Dogs are pregnant for 60 days before they’re puppies are born. A Dandie Dinmont Terrier Dog is an omnivore, (definition-they eat both other animals and plants). All Dogs are direct descendants of wolves. The number one heath problems amongst Dandie Dinmont Terrier Dogs is obesity, so always make sure your Dandie Dinmont Terrier Dog doesn't get to fat. Many foot problems that Dandie Dinmont Terrier Dogs have are just an issue of long toenails. Dandie Dinmont Terrier Dogs pant to keep cool with 10 to 35 breaths per minute with an average of 24 breaths per minute. A large dog breed resting heart beats between 60 to 100 times per minute, and a small dog breed’s heart beats on average between 100 to 140 pant a lot.